These beautiful crisp, bright, clear winter evenings have continued throughout this weekend. Although the weather is due to turn in mid-week, today was another of those surprising winter days, filled with bright sunlight and clear blue skies. Today is the Fourth Sunday of Advent [18 December 2016], and earlier this morning I served as deacon at the Choral Eucharist in Christ Church Cathedral, Dublin, lighting the fourth candle on the Advent wreath, proclaiming the Gospel (Matthew 1: 18-25), assisting at the Altar, and administering a chalice at the Holy Communion. The Revd Abigail Sines presided, the preacher was the Revd Canon Dr Maurice Elliott, the setting was Jonathan Darke’s Missa Brevis, and the Communion Motet was Anton Bruckner’s setting of the Angelic Salutation, Ave Maria, gratia plena, Dominus tecum. After coffee in the crypt, two of went to a niece’s lunchtime birthday party, and then drove further north to Malahide for lunch at the Avoca Café in Malahide Castle. As we arrived at Malahide Castle, the sun was already beginning to set in the west behind the bare winter trees, filling the clear and deep blue sky with streaks of purple, red and orange. These colours in the sky are so unusual in Ireland at this time of the year that they reminded me of the colours on a piece of pottery I bought in Rethymnon in Crete 30 years ago. After a late lunch, we emerged to the last streaks left behind the bare trees. Anyone within earshot seemed to be struck with awe by the beauty of the scene. Birds were circling in the skies above, settling on the branches of the trees. But it seemed that every time I tried to capture their movements and sounds they stopped, and just as I stopped filming they started to circle and sing again. It was an easy lesson about the futility of trying to capture nature or trying to reduce it a mere 30 seconds on a camera. I am back in Christ Church Cathedral tomorrow [19 December 2016] to preside at the mid-day Eucharist at 12.45 p.m. and for the Service of Nine Lessons and Carols at 8 p.m. It promises to be a busy week. The bright winter days with clear blue skies and startling sunshine have returned after a few rainy days, and in this part of Ireland we are enjoying bright, lengthy sunsets in the evenings. It seems hardly appropriate to be signing about the bleak midwinter, even though we are in the second half of December and close to the shortest day in winter. We are in the middle of a busy round of Carol services and pre-Christmas visits and dinners. But two of us abandoned the task of writing Christmas cards and wrapping presents early yesterday afternoon [Saturday 17 December 2016] and decided to take advantage of the mid-winter lights by heading north for walks on the beaches in Laytown and Bettystown on the ‘Gold Coast’ that runs the length of East Co Meath. As we drove through the pretty village of Julianstown, we noticed that Saint Mary’s Church was open. I loved visiting this church when I was at school nearby in Gormanston in the 1960s, and I have preached there in the more recent past. But I had never photographed its interior, and so we decided to turn back. Inside, parishioners were busy decorating the church in preparation for this evening’s candle-lit Carol Service, and we received a warm welcome as I walked around photographing the interior and the windows. There was a warm welcome too from Canon Stanley Baird, the former Rector of Swords, who is looking after the parish until a new rector arrives in March. Outside, in the late afternoon, the bare branches of the winter trees gave us clear views of the ruins of Ballygarth Castle on the eastern edges of Julianstown. The ruins stand on the banks of the River Nanny and the castle is first mentioned in 1372. Ballygarth Castle was built over a number of separate building phases. The original three-storey tower house has been enlarged over the years, with a line of crenellations and Gothic details added to the windows. The castle was part of the Netterville family estate until the 1641 Rebellion, when it was forfeited to the Crown and the Netterville family moved to Dowth. One of the earliest mentions of Julianstown is at the Battle of Julianstown in 1641, which took place near the bridge. On the eve of Oliver Cromwell’s attack on Drogheda in 1649, his Parliamentarian army camped on the lawns of Ballygarth Castle. With the restoration of Charles II in 1660, Ballygarth Castle and the surrounding estate became the property of the Pepper family from Ardee, Co Louth. The Pepper family supported James II during the Williamite rebellion, and Ballygarth Castle and estate was confiscated once again after the Battle of the Boyne. But this was a temporary setback and the Pepper family managed regained ownership. The legend of ‘the White Horse of the Peppers’ has been perpetuated in story and later in a play by Samuel Lover, which tells how the confiscated castle and lands were recovered largely through the saga of a white horse belonging to Ballygarth Castle. A white horse was always kept on the estate as a symbol of the family’s gratitude. For generations, Julianstown was the seat of the Moore family who lived in Julianstown House. The land on which the present village sits was leased to Francis and Mary Thornburgh (née Moore) in 1763 by William Moore. The land was further subleased to Colonel Charles Pepper of Ballygarth Castle in 1801. In 1856, the Pepper family made this lease perpetual under the legislation of the day and around 1889 the Pepper family built the cottages that can be seen in the village today. These Swiss Cottages on Main Street form a series of six attractive cottages said to be based on a design that Major Charles Pepper saw in Switzerland. Major Pepper also built cottages in neighbouring Stamullen. Ballygarth estate is reputed to be the last place in Ireland where oxen were used for ploughing up to 1907. An ox-collar or harness, made by Thomas Oonan of Julianstown, is preserved in the National Museum of Ireland. Ballygarth Castle remained in the hands of the Pepper family until Colonel Charles Pepper died in 1927. From the ruins of Ballygarth Castle we drove on towards Laytown, and stopped before the railway bridge where the banks of the River Nanny widen to form a tidal estuary before flowing into the Irish Sea immediately south of Laytown. The River Nanny flows to Laytown from Kentstown and local folklore says Saint Patrick banished all the salmon from the river. However, the river abounds with wild trout, however, and is stocked with brown trout, which accounts for more than half of the annual catch. The estuary stretches for about 2-3 km inland and is narrow and sheltered, with muddy sediment. 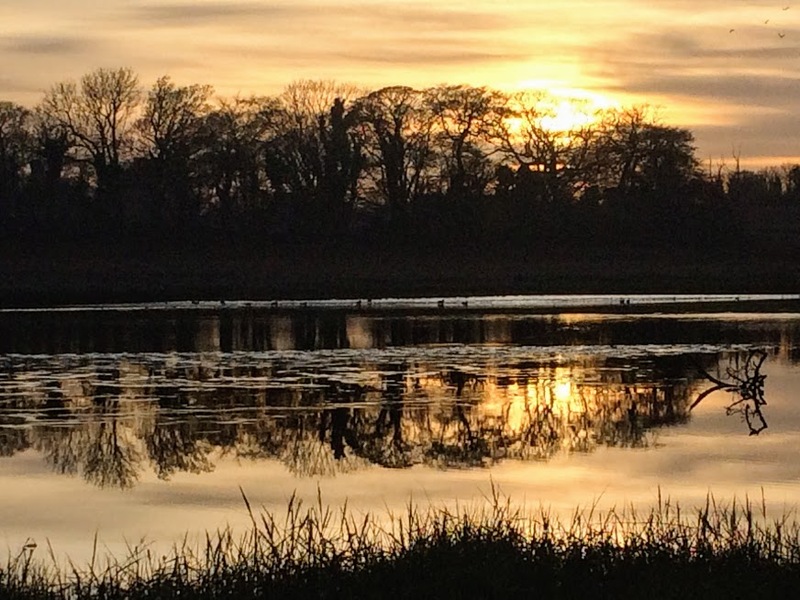 At this time of the year, the estuary provides an important haven for wintering wading birds, protected under the European Union Birds Directive. The formation itself is narrow and sheltered, providing an excellent habitat for water birds. Golden Plovers, various oyster catchers, Ringed Plovers and Sanderlings shelter here over the winter. Other resident water birds include Brent Geese, Bar-tailed Godwits, Great Black-backed Gulls, Common Gulls, curlews, dunlins and cormorants. During the 19th century, the old village of Corballis on the banks of the Nanny developed into a thriving fishing village. By the end of the 19th century, there were 23 houses and 127 people living there. A schoolhouse was built to cater for the children of the coastguards working in the Coastguard Station nearby. Many people were employed looking after mussel beds which were laid down in the Nanny estuary, and there was also a little cottage industry, growing willows in the Legberry stream for making potato baskets. These industries continued until 1937, when the Laytown sewerage scheme was put in place. Earlier, the Coastguard Station was destroyed in the Civil War. With the decline in population there was no longer any need for the school and in recent times the building has been renovated and is now a private house. Having walked along the south banks of the estuary, two of us then continued on to the beach at Laytown, where we walked on the sand as the dusk began to close in. Dusk had turned to darkness by the time we arrived at Bettystown. In Relish, we were given a table for two at a bay window looking out over the sandbanks and down onto the long stretch of beach, catching glimpses of the waves as we dined. We have come to the last week of Advent, today is the Fourth Sunday of Advent, and there is just a week to go to Christmas Day. Throughout this time of preparation for Christ’s coming at Christmas, I am praying each morning in Advent and using for my reflections the prayer diary of the Anglican mission agency, USPG (United Society Partners in the Gospel). 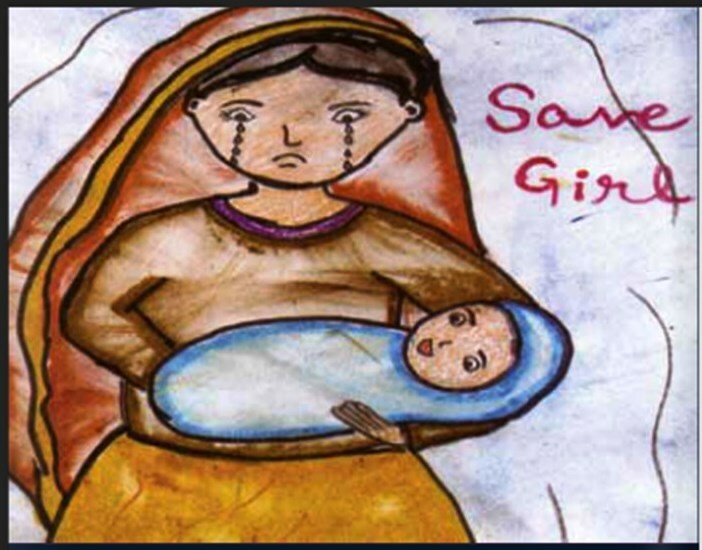 This year, as we light our Advent candles, USPG is inviting us to pray for mothers and babies in Tanzania and around the world. The four Advent candles remind us that the coming of Christ was anticipated over many generations. Each Sunday of Advent we remember faithful participants in that journey of faith: The Patriarchs and Matriarchs, The Prophets, Saint John the Baptist, and finally the Virgin Mary. The fifth candle, lit on Christmas Day, reminds of the birth of Jesus Christ, Saviour of the world. As we journey through this season of Advent, we are invited to pray for those who through their life’s journey are in need of a Saviour today. and hope to all who carry and nurture children today. ‘Depending on where they live and their family’s economic capacity, children might have very different hopes for Christmas Day. While some hope for the latest toys, others have more basic wishes: safety, food, education. ‘The Delhi Brotherhood Society invited children to draw pictures that described their lives and their hopes for the future. ‘Suman, 12, wants her neighbours to enjoy an environmentally-safe Diwa (Festival of Lights) by lighting lamps instead of fire crackers ‘because crackers add pollution to the air’. ‘Mantasha, 15, who wants to be a professor, urges communities to observe environmental cleanliness to help stop the spread of diseases. for the joy, wonder and innocence they share. Protect children whose childhoods are taken away. Help us work together for their protection and care. Isaiah 7: 10-16; Psalm 80: 1-8, 18-20; Romans 1: 1-7; Matthew 1: 18-25.